Dia Frampton performed a second residency show at The Hotel Cafe in support of her new album “Bruises.” Los Angeles, CA. 3/30/2017. Photos courtesy of Jessy Gonzalez. 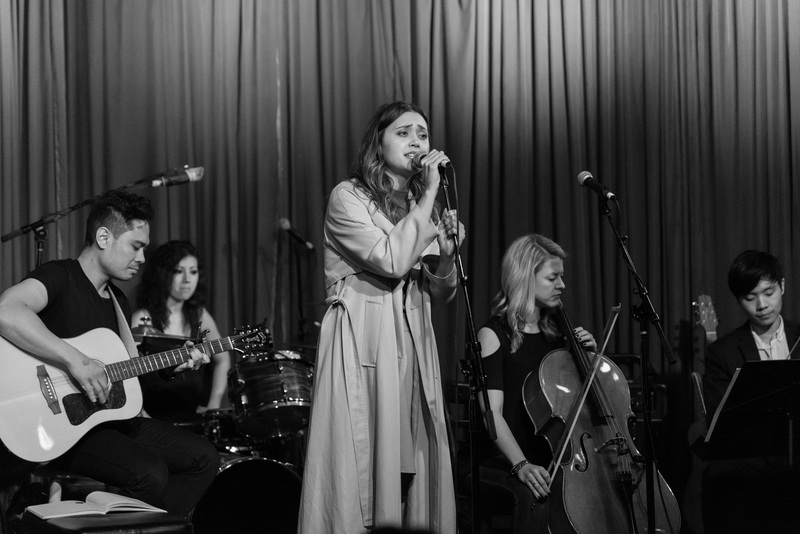 A residency show at the Hotel Cafe showed singer-songwriter Dia Frampton at her pure, unfiltered, unadulterated musical best. “Turning 30 is uncomfortable,” Frampton said. “But it’s cool. I’m totally fine,” she laughed. Upon the release of her new album Bruises — the follow-up from her 2011 post-Voice debut solo album Red and her 2014 orchestra pop project Archis — Frampton graced the Hotel Cafe main stage last Thursday, March 30 for the second of three residency shows in Los Angeles. Her set, accompanied with guitars by Carlo Gimenez, drums and percussion by Jess Bowen and a two-piece cello and violin orchestra set, was both delicate and effortless. Frampton’s vocal maturity and comfort onstage allowed her to sing through her songs with ease as her commentary on death, a fear of flying and numerous ex-boyfriends kept the edge off — and kept us laughing. She opened with the stunning “Lights” off of her new album after describing her mild freak-outs with death and “accepting that and enjoying what you have here.” Her voice soared over the rhythmic guitar and sweeping strings as the dragging drumbeat carried her along. The song, in which she sings, “Where did all the years go wrong? When did all my youth move on?” succeeds in capturing the spirit of Bruises and her long, hard-fought struggles within the music industry. 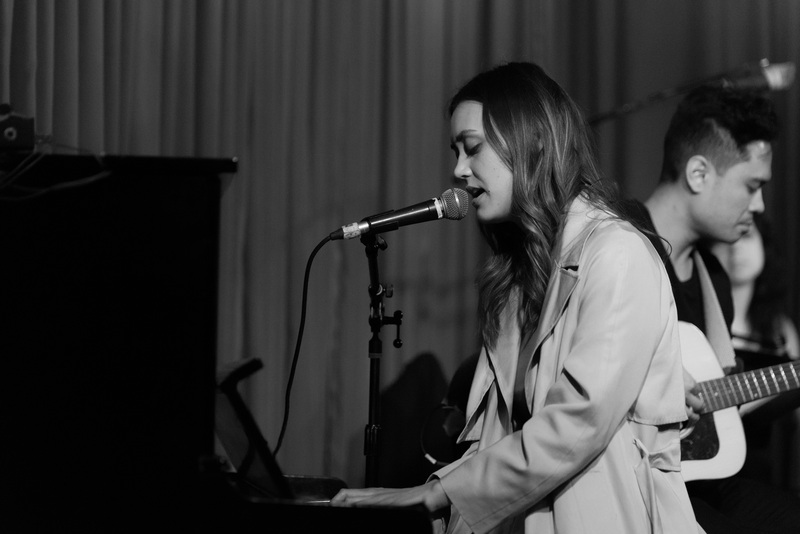 Dia Frampton took to the piano as she played a second residency show at The Hotel Cafe in support of her new album “Bruises.” Los Angeles, CA. 3/30/2017. Photos courtesy of Jessy Gonzalez. She took to the piano as she presented “Don’t Look Back,” a beautifully sweeping ballad accompanied by the gentle build-up of drums and percussion. “Don’t you dare look away / I’ll keep you close to the light,” Frampton assured in the song as she commented on her faltering confidence as she’s gotten older. Frampton, known to be light in commentary and sarcastic in tone, kept a smile on throughout her set as she joked about the dark and emotionally honest material on her album. After performing a stripped-down cover of James Taylor’s “Fire and Rain,” she went into “Daniel” from 2011’s Red, a song she shamelessly named after a relationship with a guy named Daniel. “I was crying over this guy and now I’m liking pictures of his child on Instagram. Life goes on,” Frampton assured as the crowd laughed. She breezed through the next few songs as she asked opener London Thor to join her in their sweet, lullaby-like cover of Bruce Springsteen’s “Dancing in the Dark,” a song Frampton picked up the guitar and sang well with Thor’s softer, airy vocals — like an older sister carrying a younger one. The rest of the band came back onstage and performed a breezy rendition of “Trapeze” off Red. With a smile and ease of expression, Frampton’s ability to make light of her struggles — whether in love, heartbreak or growing older — was both charming and pleasant to watch. Her songs and performance felt easy and comfortable as she exuded a sense of peace and contentment with where she is in her life. If Frampton’s performance was any indication of her growing emotional maturity, her songs and album as a whole clearly evoke that sense of maturity and acceptance in herself. Frampton seems to have reached a point in her career where she seeks approval from no one and continues to do work the best she can. An emotionally honest and mature record, Bruises signifies Frampton’s rebirth as she pulls herself out of her darkness and into the light and continues to stand on her own two feet, going with where life takes her. And I don’t know about you, but I feel that’s the only way to live. Dia Frampton delivered a light yet emotionally-rich performance in support of her album Bruises , now available to purchase through Amazon. Be sure to catch her last residency show in Los Angeles at the Hotel Cafe (tickets) this Thursday, April 6 and keep up with Frampton at http://diamusic.net.